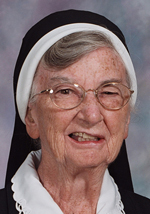 Sister Helen Veronica Hamill, O.S.F. Sister Helen Veronica Hamill, O.S.F., 88, died May 21 in Assisi House, Aston. She had been a professed member of the Sisters of St. Francis of Philadelphia for 67 years. Born Marguerite Patricia Hamill in Philadelphia, where she was a member of St. Michael Parish and a graduate of John W. Hallahan Catholic Girls’ High School, Sister Helen entered the congregation in 1946 and professed her first vows in 1949. Her sister, Sister Marguerite Joseph, also entered the congregation and is also deceased. Shortly after she entered the congregation, Sister Helen ministered in education, teaching at St. Elizabeth School in Baltimore and Holy Angels School in Trenton, N.J.
She spent most of her 67 years in health care ministry. She studied nursing in St. Joseph Hospital School of Nursing in Baltimore and became a registered nurse in 1954. She later went on to earn a bachelor’s degree in nursing from Villanova University in 1967. Sister Helen Veronica ministered in the Archdiocese of Philadelphia for 54 years. She worked at St. Mary Hospital in Philadelphia, first as OR supervisor and later at ICU supervisor. At St. Mary Medical Center in Langhorne, she served as ER supervisor. From 1977-1994, Sister Helen served as nurse supervisor at Assisi House, the retirement residence for the Sisters of St. Francis. She later ministered at Immaculate Mary Home in Philadelphia where she served as chaplain’s assistant. In 2009 she retired and moved to Assisi House where she served in prayer ministry. All services will be held in Assisi House, 600 Red Hill Road in Aston, on Thursday, May 26. A Christian Wake Service will be held at 9:30 a.m. followed by viewing. The funeral Mass will be celebrated at 11 a.m. Burial will be in Our Lady of Angels Cemetery in Aston. Sister Helen Veronica is survived by her nephew, nieces and cousins, and by her Franciscan family.